Upon arrival into the small city of Ketchikan you’ll come across the bald eagle statue and the Ketchikan city sign. These are popular landmarks to get your photo taken with as evidence you have been to Ketchikan. You can also find the worlds largest collection of totem poles in the downtown area. Ketchikan is famous for Creek street. On this street you’ll find lots of shops and in the creek you’ll see Salmon. You shouldn’t miss the Dollys house museum, married mans trail or the salmon ladder. You won’t see any bears at Creek street, if you want to see bears you’ll have to take a tour. There are many kiosks in Ketchikan selling tours with guaranteed bear viewings. You can also book tours online but I’d recommend comparing the prices at the kiosks first. The kiosks are competitive and the prices are negotiable. The most famous bar in town is the Arctic bar and liquor store. The Arctic bar is the oldest bar in Ketchikan dating back to 1937. This is the only bar in the world that’s been lost at sea and then recovered. During flooding in 1956 the bar was actually swept away with a tenant still inside, the tenant survived and the bar did too. If you are into bar logos then you’ll find the Arctic bar logo very interesting, if you like it you can take home a piece of the Arctic bar merchandise. Dolly’s house used to be the red light district of Ketchikan from the 1920’s to the 1950’s. In this period Ketchikan was prosperous and full of fisherman and miners. Those single men needed some female companionship and Dolly’s house served that purpose. Nowadays it’s a museum and you can see how it used to be back in the day. From Ketchikan I returned to the Princess cruise ship. The next destination is Juneau, the capital of Alaska and home to the Mendenhall glacier. This was an overnight journey whilst enjoying shows and eating at lots of buffets. I laughed when I read that now the brothel was a museum and you can ‘see how it used to be back in the day’. LOL! I’m sure it is a G rated. 🙂 I’ve not been to Alaska and the whole family wants to visit. This town looks like it needs to be on our itinerary. 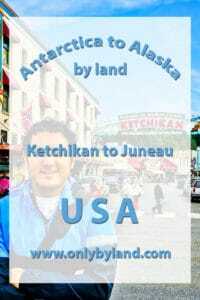 Ketchikan is on my list so enjoyed your fun overview of the town. I would definitely stop by that bar and now I am curious so I have to look up the logo. And a great story about how it was lost at sea and recovered. That’s a reason to go there for sure. I have not heard about Ketchikan. Although looks like the city provides a lot of interesting day trips. I like these kind of places where you have option to do day trips in and around. Alaska is my dream destination. I haven’t read about Ketchikan yet. Creek street looks beautiful! Those colorful houses, woods nearby,and salmon.. just perfect. What an interesting story about the Arctic Bar. I can’t imagine what it would be like to be swept out to sea in a building! Crazy! I think I would want to see the bear, but the totem poles would top my list, too. Actually everything you listed sounds pretty amazing. 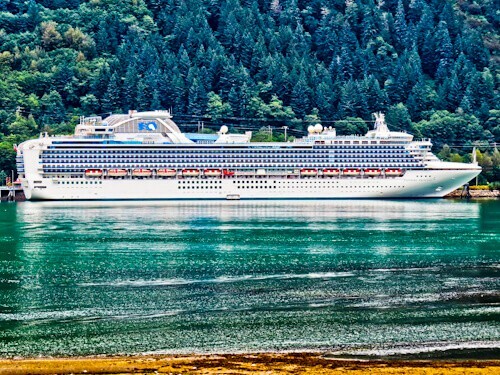 I would love to visit Alaska someday soon and a cruise sounds like a way to do it! Interesting tidbit about Dolly’s. So far, oh so very far from my home in Western Australia. Maybe one day. The arctic bar seems epic … I would love to have a drink here! I would love to visit Alaska someday… it’s so far away from India. I would love to add the bear tour to my initerary. Cruising in this side of the world looks like such a great experience. You can discover and explore spots like this of which you’d never really hear much of on travel guides to Alaska. It’s interesting how they converted that brothel into a museum – it looks like the place has much history on its own. Yes Yea Yes to buffets on cruise ships lol. How cool would that have been to be in bar that was swept away by flood. Glad to see both the bar and the patron came out unscathed. OMG! You never stop, right! sooo jealous! Alaska is like a dream destiantion! I hope you shre more posts about this country! I would love to go and see the bears catching the salmons. How can I go in this excursion? Is it by land or sea? We are going in the Princess Cruise. I went with Princess as well. You can book the excursion with Princess on board or organize it when you get to Ketchikan when you arrive which is a little cheaper. I noticed some people had already booked online way before taking the cruise, this must be the cheapest method of booking a tour in Ketchikan.